STOP THE SCAM •	SPAM! WHAT TO DO WHEN YOU GET THOSE PESKY SCAM CALLS! FES TEAM NEWS New team members! Be a contributor! 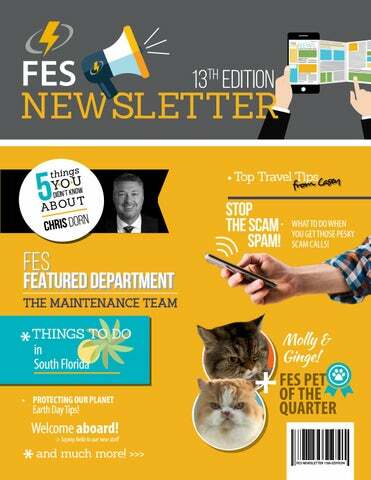 Don’t forget you can contribute to the quarterly newsletter! Don’t let us have all the fun, join us! In this edition we got contributions from Chris Dorn, Casey Culbertson, Maria Foes and Lydia Greenstein. Thank you all! Repeatedly Repeatedly Repeatedly Repeatedly Repeatedly Repeatedly Repeatedly Repeatedly Repeatedly We are what we repeatedly do. excellence Excellence Then, is not an act, But a habit. the same habits should not be an option for any of us. the wind off our sails and instead, use them as challenges and opportunities to improve. Taking accountability for our work and taking responsibility for our Future Energy Solutions! actions in and outside of FES is one of the most important changes we can make to better ourselves. ¡¡ Every employee has his or her birthday off as a discretionary holiday “off”. ¡¡ Days shaded in gray are the US Holidays and discretionary days we have off this year. Molly & Ginge’s Human: Maria Foes WHAT MARIA SAYS ABOUT MOLLY & GINGE: I picked Ginge from a group of 10 kittens 11 years ago. It was an easy choice: he was so friendly and sweet! Two years later I came back to the same family that gave me Ginge and got Molly. Ginge is the coolest cat ever and has converted many naysayers into saying things like “I don’t like cats, but I like Ginge”. THANK YOU	To all our new members of staff and our new Business Development members, for your daily hard work and dedication to FES. Thanks to you, we keep growing into an award-winning Company filled with talented and committed people. We look forward to seeing where your path at FES leads you! BUSINESS DEVELOPMENT NEWEST TEAM MEMBERS! 1. What movie can you watch over and over again? Top Gun 2. What accomplishment(s) are you most proud of? Being a Dad to Taylor Christopher Dorn (28) and Bryce Allen Dorn (24). I love being a dad! 3. Tell us about someone you really admire. My parents…. No matter how good or bad we always had everything we wanted and needed. 4. Is there a documentary or book that really changed the way you thought about something? Don’t read much…But the 3 rules by Lou Holtz guide me most days. 1. Do what is right. 2. Do everything the very best of your ability. 3. Show people you care. 5. Tell us something we wouldn’t know just by looking at you. I once upon a time could throw a baseball 90 plus mph. I am the most competitive person you may ever meet. Shorts, T shirt and flip flops are my favorite clothes to wear… .The dad clothes every day make me CRAZY! STAFF Thank You! Thank you, Chris! a message from our CEO It is with great pleasure that I can announce that FES has concluded a refinancing exercise with Deutsche Bank. As the 15th largest bank by assets in the world, Deutsche Bank (DB) provides commercial and investment banking, retail banking, transaction banking, and asset and wealth management products and services to corporations, governments, institutional investors, small and medium-sized businesses, and private individuals. Deutsche Bank is Germanyâ&#x20AC;&#x2122;s leading bank, with a strong position in Europe and a significant presence in the Americas and AsiaPacific. DB will sit alongside our existing funders and partners, Orion Energy Capital who have committed capital for a further three years with us. The new DB phase 1 facility of $100 million allows FES access to the size and scale of funding that will enable FES to continue its rapid expansion. As part of this fundraising, we have undertaken some simplification and back office administration which allows the business to be more streamlined as we grow. 1. Merging two of our three Contracts entities (Future Energy Solutions Contracts No. 2 LLLP and Future Energy Solutions Contracts No. 3 LLLP) into Future Energy Solutions Contracts No. 1 LLLP; 2. 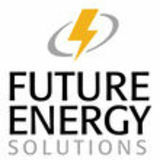 Sale of FES GIP Customer contracts in Future Energy Solution Services Inc. to Future Energy Solutions Contracts No. 1 LLLP. As I have already mentioned, there is no change or impact on the maintenance company â&#x20AC;&#x201C; Future Energy Solutions Maintenance LLC or our servicing arm - Future Energy Solutions Services LLC. These remain as is. FES has written to all our Customers affected by these changes and I wanted you all to be informed in the event that any Customer reaches out to you with any questions. Questions can then be filtered back to myself or Simon. FES SIGNS MAJOR DEAL WITH DEUTSCHE BANK ABOUT DEUTSCHE BANK Deutsche Bank (DB) is a leading global investment bank with a strong and profitable private clients franchise. A leader in Germany and Europe, the Bank is continuously growing in North America, Asia, and key emerging markets. Their services include commercial and investment banking, retail banking, transaction banking, and asset and wealth management products and services to corporations, governments, institutional investors, small and medium-sized businesses, and private individuals. Founded in 1870, to accompany German businesses into the world, DB is now Germanyâ&#x20AC;&#x2122;s leading bank, with a strong position in Europe DB has been nominated and has won many leading awards in the and a significant presence in the Americas and the Asia Pacific. banking industry. Against a backdrop of increasing globalization in the world economy, DB is very well-positioned, with significant regional diversification and substantial revenue streams from all the major regions of the world. DB has substantial expertise in the energy sector having financed many long-term contract businesses like FES, but with different types of income streams created by energy renewables, solar and battery installations. Therefore well placed to fund FES as we grow in the years ahead. With more than 78,000 employees in over 70 countries worldwide, DB offers unparalleled financial services throughout the world. DB has established strong bases in all major emerging markets and The Bank competes to be the leading global provider of financial therefore has good prospects for business growth in solutions for demanding clients creating exceptional value for its fast-growing economies. shareholders and people. For more information, visit www.db.com. Free Items to Take Advantage of on Your Next Trip by Ashlee Kronforst and Ryan Monk. ask. Prior to boarding see if there is an option to upgrade your seat for free, and definitely note if it’s a special occasion such as your honeymoon. A little kindness can go a long way with the gate agents. Once on the flight, you can always scope out the seats to see if you can move to an open row and have it all to yourself. If you’re up for it, you can also move to an emergency exit for the most legroom. Of course, it is always a good idea to talk to the flight attendants before doing this. should be able to track them down for you. are guaranteed the special meal as others can choose that option in flight. Second, special meals are handed out first which means you get to eat first! forgot to pack more? Flight attendants have first aid kits available and ready. WIFI & ENTERTAINMENT Most flights have built in entertainment in the seat head in front of you. headphones? Your flight may have free pairs available. a growing list of airport restaurants. lounges you have access to. COCKPIT TOURS A favorite of the free items on this list for aviation geeks is a free tour of the cockpit. Available especially if you’re traveling with young children, but I don’t think you’re ever too old for this. Most likely to be available after the plane has landed, ask your flight attendant if you can take a quick tour of the cockpit. If you are traveling with small children, make sure to ask for their wing pins as a fun souvenir from your trip. PROTECTING THE EARTH IS OUR HOME Right now, our home is in serious danger, but if we all make a conscious effort to go green, and encourage our family and friends to do the same, we can slow down and even eliminate some of the damage that is currently happening. Going green is easier than you think! There are little things you can do every day to help reduce greenhouse gases and make a less harmful impact on the environment. Taking care of the Earth is not just a responsibility -- it’s a privilege. In that spirit, here are five things you can do to help save the earth. 1. Leave your car at home Walk or ride your bike to work, school and anywhere you can. You can reduce greenhouse gases while burning some calories and improving your health. If you can’t walk or bike, use mass transit or carpool. Every car not on the road makes a difference. 2. Reduce, Reuse, Recycle I know you’ve heard this one before, but it’s so important! You can help reduce pollution just by putting that soda can in a different bin. If you’re trying to choose between two products, pick the one with the least packaging. If an office building of 7,000 workers recycled all of its office paper waste for a year, it would be the equivalent of taking almost 400 cars off the road. 3. Turn the lights off! Turn off lights when you’re not in the room and unplug appliances when you’re not using them. It only takes a second to be environmentally conscious. 4. Start gardening Plants and Trees provide food and oxygen. They help save energy, clean the air and help combat climate change. Gardening has also been proven to reduce stress and increase self-esteem. 5. Shop Wisely Instead of using plastic bags that most stores provide, invest in a few reusable bags. Plastic bags are not easily decomposed and contribute to the degradation of the environment. A plastic bag can take anywhere from 15 to 1,000 years to break down. Food stores like Aldi are already ahead of the game with this, they are also significantly cheaper than the other leading grocery stores like Walmart, Publix, and Target. Saving money while helping the environment sounds like a win-win to us! THE FES MAINTENANCE TEAM JOSHUA WILSON | Maintenance Supervisor Josh is in charge of the entire Maintenance Operation. As the Team’s Supervisor, he ensures our technicians handle requests in a quick manner and when it comes to Contractors, he ensures his team keeps costs down while providing the best quality service. Josh also submits a monthly report, which he has made his main goal in implementing and providing detailed reporting for the team’s success SATCHEL DUNBAR | Maintenance Coordinator Satchel started at FES a year ago in the Project Administration Department and quickly showed potential to help in our Maintenance Team. Always very helpful and ready, Satchel takes care of maintenance requests quickly, and liaises with Contractors on a daily basis. KRISTIAN HOVEN | Maintenance Coordinator Kristian started his career at FES working as a Lighting Technician in our Warehouse in the Production & Assembly Team. After showcasing potential to handle more responsibility, he got promoted quickly to Maintenance Coordinator, where he handles requests and provides quick answers to his team and to Customers. THE FES MAINTENANCE TECHNICIANS Led by Joseph Grooms, our Technicians are very experienced and trained in the highest safety certifications. They are a group of some of the hardest workers in the Company! THINGS TO DO IN SOFLO MUSIC IS A UNIVERSAL LANGUAGE. without fail. It is undoubtedly one of the most universal features of the human experience. way down to Miami in May for her Sweetener Tour. Grande’s latest release, “Thank U, Next” has been on the Billboard Hot 100 list since its release in February 2019. Former Fifth Harmony member, Normani, will also be joining Grande on her upcoming tour. lineup of festivals and concerts happening right in our backyard. Keep reading to see some of the great music that will be making its way down to the Sunshine State in the very near future. for a General Admission 1-day pass. including Jorja Smith and Tyler the Creator. You’re just sitting minding your business when suddenly, your phone rings. You’re hoping it’s your husband, girlfriend, maybe your dog, literally anyone but “Scam Likely” and yet, it always seems to be them! Lucky for you, there’s a few things you can do to reduce or even eliminate Spam calls for good! Keep reading to find out how. 1. CALL YOUR SERVICE PROVIDER AT&T, Verizon, and T-Mobile all offer fraud and security resources that help reduce the number of Spam calls you receive. They also offer additional tips for reducing robocalls. 2. DOWNLOAD AN APP Apps like TrueCaller, Hiya and Robokiller are all apps that assist in blocking Spam callers. You can download them for both Android and Apple devices. 3. NATIONAL DO NOT CALL LIST You can register your mobile number and land-line number on the “National Do Not Call List” in less than 5 minutes by visiting donotcall.gov. Your number(s) will remain on this list until you remove it or you discontinue service. Once you register, you will not have to re-register unless you get a new number. Whether you are on the National Do Not Call Registry or not, tell unwanted callers that you do not consent to the call and to put you on their internal do not call list. Make a record of the caller’s number and when you made your request not to be called, and file a complaint with the FCC if the caller does not comply with your request. Additionally, many states now have statewide do-not-call lists for residents. Florida Residents should visit www.fldnc.com to be put on the “Florida Do Not Call List”. For your friends and family out of state, they can contact their state’s public service commission or consumer protection office to see if their state has such a list and to find out how to register their number or numbers. To find contact information for their state public service commission, they can check the government listings or blue pages of their local phone directory. DISCLAIMER The FES Lighting US Group LLLP (“FES”) documents are an estimate and for discussion purposes only and do not purport to contain all information that may be required to evaluate the transaction or the financial position of the savings or project opportunity. No representation or warranty, express or implied, is given by or on behalf of FES, its affiliates, subsidiaries, members, directors, officers or employees or any other person as to the accuracy or completeness of the information or opinions contained in this document and no liability whatsoever is accepted by FES, its affiliates, subsidiaries, members, directors, officers or employees or any other person for any loss howsoever arising, directly or indirectly, from any use of such information or opinions or otherwise arising in connection therewith. The information and opinions expressed in the FES documents are provided as of the date of this document.